Kristi, of OliveArt.Etsy.com, sent us this journal for the book swap. She has used a variety of business envelope security patterns to create the covers by cutting the patterns into strips and arranging them on the book board. 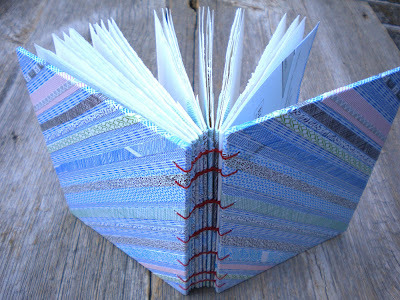 She has also wrapped each signature with strips cut from envelopes so the exposed spine also displays similar patterns. 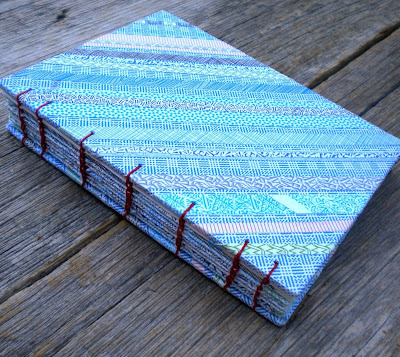 The journal is bound using a chain stitch, sewn with red thread. There are also some envelopes used inside the book for the first page and as the endpapers on the inside of each cover. Visit OliveArt.Etsy.com to see more of Kristi's work. This is the book I got from the swap! Thanks Kristi! !